In a few months, the Department of Defense (DoD) will pick a company to build a cloud computing system for the U.S. military. The prize is a two-year contract that could end up being extended for a full decade and be worth billions of dollars. The winner could also obtain a virtual monopoly over the federal cloud-computing market for the foreseeable future. The odds-on favorite to win the Joint Enterprise Defense Infrastructure (JEDI) contract is Amazon Web Services, which currently manages a $600 million cloud system for the intelligence agencies and, through its network of “partners,” already has a stake in other federal cloud projects. Amazon’s dominant market position and past experience hosting sensitive government data give it a solid advantage over its primary competitors—Leidos, General Dynamics, Oracle, Microsoft, IBM, and Google. Despite pleas from these companies, who fear Amazon may have the inside track, DoD will not waiver from its plan to award JEDI as a winner-take-all, single-vendor contract. Amazon is no longer an upstart online bookseller from Seattle. The company has taken its place among the federal government’s contracting heavyweights, employing the traditional methods of Washington influence in its quest to land the JEDI contract. Amazon’s political action committee has given over $1 million in campaign donations to federal candidates in the past two election cycles, doling out the money to both parties in nearly equal shares. The company has spent over $37 million on lobbying since 2015, getting face time with Members of Congress and officials in the executive departments on matters involving cloud computing and myriad other issues. Those efforts appear to have paid off last year with the passage of the so-called “Amazon amendment,” a provision tucked into the defense authorization bill that will establish a program facilitating government purchasing through e-commerce portals like Amazon.com. Amazon has also been taking advantage of the revolving door, hiring its share of former government officials. According to the watchdog group Center for Responsive Politics, 59 of Amazon’s 90 lobbyists (not all of whom worked, or are working, on cloud or IT issues) are “revolvers” who had previously worked for the federal government. Scott Renda, who oversaw an Office of Management and Budget (OMB) cloud computing initiative during his tenure in the Obama Administration, joined Amazon Web Services in 2014. Former Obama White House press secretary Jay Carney became Amazon’s senior vice president for global corporate affairs in 2015. Former U.S. Chief Acquisition Officer Anne Rung left the White House in 2016 to lead the government affairs division of Amazon Business. Rung spent two years as the leader of OMB’s Office of Federal Procurement Policy, which plays a central role in shaping how the government purchases goods and services. From the other end of Pennsylvania Avenue, the company enlisted the lobbying services of former Senators John Breaux (D-LA) and Trent Lott (R-MS) and former Congressional staffer Rich Beutel. Beutel, the former lead staff member of the House Oversight and Government Reform Committee, was once described as “a player at the forefront of cyber [and] contracting.” Between 2015 and March 2018, Beutel represented Amazon Web Services before Congress and the White House on a range of issues, including cloud acquisition and deployment. Amazon Web Services was also a client of Sally Donnelly, a well-connected political consultant who recently served as a senior adviser to Secretary of Defense James Mattis and was a consultant on the Defense Business Board, a DoD advisory panel of private-sector executives. 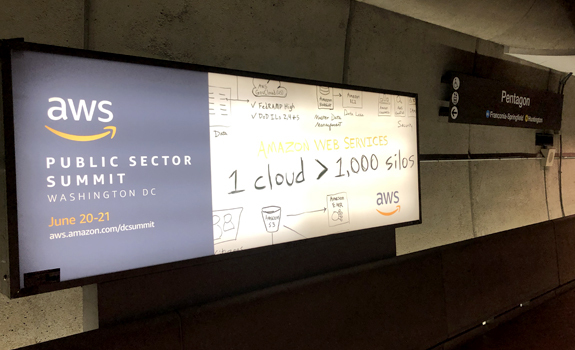 For added measure, Amazon is making its presence known on local magazine covers and on the walls and floors of the Washington Metro. This public relations blitz may actually be targeting two audiences: the DoD officials who will choose the winner of the JEDI contract, and local politicians in DC and the neighboring suburbs in Maryland and Virginia hoping to be chosen as the site of the company’s second corporate headquarters. However, victory for Amazon is not a foregone conclusion. The competing tech and defense heavyweights also know how to play the influence game. Most of the companies—particularly General Dynamics and Google—are keeping pace with Amazon’s level of spending on elections and lobbyists. The revolving door spins just as rapidly at Amazon’s competitors: more than three-quarters of Microsoft’s 90 lobbyists previously worked in the federal government, while the board of directors of Leidos currently boasts former senior Pentagon officials Gregory Dahlberg and Frank Kendall. The revolving door took a big turn in the other direction last year at General Dynamics when James Mattis left the company's board to become Secretary of Defense. Meanwhile, former Google CEO Eric Schmidt, Google vice president Milo Medin, and Microsoft board member Reid Hoffman serve on the Defense Innovation Board, where they advise DoD on technology and acquisition matters. Oracle CEO Safra Catz was a member of the Trump transition team. She recently got a chance to discuss the JEDI competition at a private dinner with President Trump, who has made no secret of his animosity toward Amazon. Perhaps Catz or someone else at the dinner mentioned that she and four other Oracle executives made a total of nearly $35,000 in campaign donations to one of the President’s staunchest supporters in Congress: House Intelligence Committee Chairman Devin Nunes (R-CA). Oracle is reportedly leading a campaign with other tech companies to “unseat Amazon as the front-runner” for the JEDI contract. DoD will award the JEDI contract in late September. 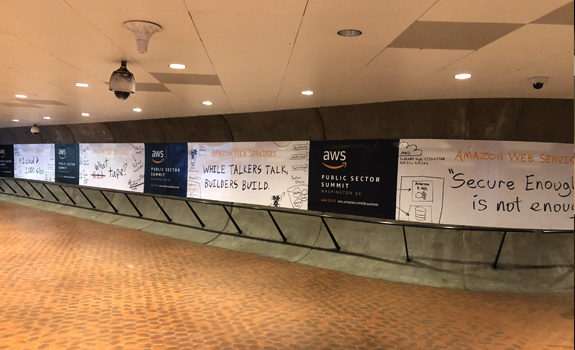 For the next few months, Amazon and its competitors will flood the Washington area with lobbyists, campaign donations, attractive job offers, and eye-catching advertisements. The millions they spend now could pay off in the billions later. In the meantime, we need to ask two important questions. First, is it a good idea to award the contract to a single vendor? The DoD reasons that scattering data across multiple cloud systems would inhibit the ability to access and analyze critical data, and that it has “multiple mechanisms” in place to prevent a monopoly. However, tech and federal procurement experts dispute the government’s justifications for making JEDI a single-award contract. Second, should the government do more to develop an in-house capability to run a cloud system? The DoD will likely pay significantly more for a contractor to operate and manage the system, over which the contractor will retain exclusive ownership rights. Ten years is an uncomfortably long period of time to entrust such a vital function to one private company.